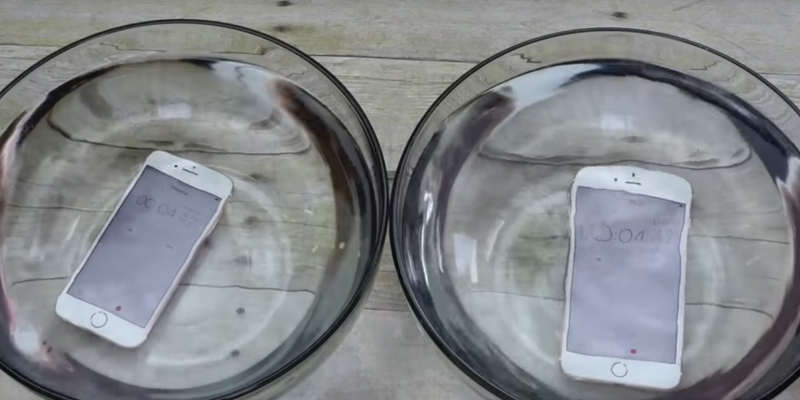 A few videos have surfaced over the last few days, apparently showing the iPhone 6s to be considerably more water-resistant than anyone might have thought. See, there’s another one below. It purports to show an iPhone 6s and 6s Plus being left in bowls of water for more than an hour without any visible harm. That’s pretty impressive if the video is legit, but it isn’t a reason for you to try and re-enact it yourself. And definitely, definitely, don’t believe your iPhone is fully waterproof because of videos you see on the internet. Is it (and other similar ones) real? I have no idea, but I do know that an iPhone has a far better chance of surviving tap water (rather than sea water or pool water) at a depth of zero feet than any real-world scenarios in which you might conceivably end up with your phone in the wet stuff. As you can see from the video above, at any depth at all (and chlorinated water in this case) the iPhone dies in less than two minutes. Apple’s newest flagships might have a natural resistance to water but there’s a good reason that Apple doesn’t tout this in its marketing and advertising – the phones aren’t waterproof. Anything else that happens is on you. Can they survive an hour in a bowl of water? Maybe (but I wouldn’t try it). Will they survive you jumping in the pool with it in your pocket by accident? Probably not. Will it survive sea water? No way. Even if the iPhone 6s is ‘waterproof,’ there’s few practical situations in which this is likely to help you out – unless you frequently find yourself dropping your phone in puddles.